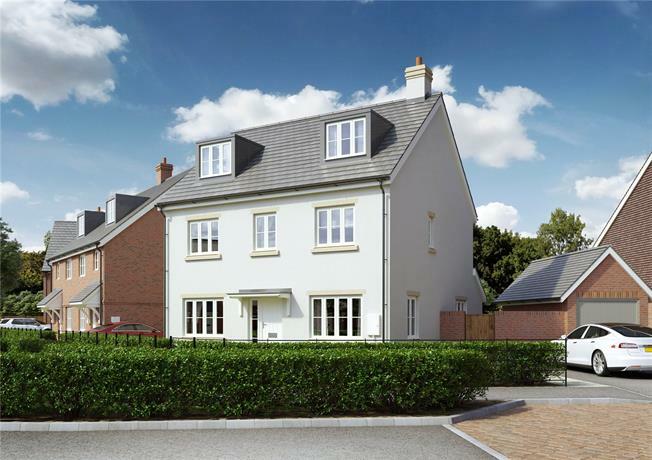 5 Bedroom Detached House For Sale in Hailsham, East Sussex for Guide Price £490,000. French doors open out to the garden, making it an ideal space for family living and entertaining alike. The ground floor is completed by a cloak room and family room. To the first floor, there are 3 bedrooms, each with wardrobe space and one with en-suite shower room. There is a further study and contemporary family bathroom. Stairs lead to the second floor, where there is a further bedroom and spacious master bedroom with en-suite shower and generous wardrobe space. Ambersey Green is a select development of contemporary 2, 3, 4 and 5 bedroom properties, designed to the highest modern standards. It is the ideal choice for anyone who loves country living, with an excellent range of amenities within easy reach. A combination of traditional architecture and plenty of open green space is key to the appeal of Ambersey Green, with a wide diversity of house types creating a great visual appeal. All the homes have private parking and there are visitor spaces conveniently placed throughout the development. Ambersey Green enjoys a peaceful setting amongst fields and woodland, while being close to the market town of Hailsham where there are plentiful shops, pubs and restaurants. Situated in the East Sussex countryside, with the High Weald to the North and Pevensey Levels to the West, there is a plethora of outdoor pursuits to enjoy.